The Romans were present in the Iberia peninsula for for over 600 years, from 218 BC to AD 409 and brought about many changes, including the introduction of Rome (romantic) based languages (which is still the basis for all the languages used in Spain except for Basque), a legal system, and strong architectural and engineering skills. Some of the most impressive relics of the Romans engineering skills in Spain are the aqueduct of Segovia and the bridge across the river Tormes at Salamanca. The Romans also built roads (34 major roads totalling over 20,000km), which some say were still the best roads in Spain until the early 1900's. The Romans also introduced irrigation techniques and developed agriculture, particularly olive, wheat, and wine production. Rome created a united Spain which was to become the pride of the Roman Empire but it took 200 years of fighting to get there - initially with the Cartaginians, then the Celts and Iberians. Over the two centuries of fighting, various pockets of strong resistance broke out, with the last one ones being in Cantabria and Asturias. Although the Basques were defeated, they were never really romanised in the same way as the rest of Iberia. 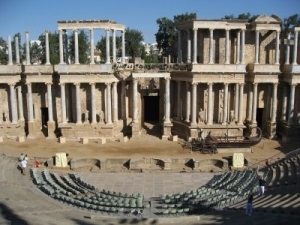 The most important Spanish cites in Roman times were probably Mérida, Córdoba, Tarragona, Zaragoza, Cartagena, Cadiz and Gerona, all of which still have Roman relics to see. Two other changes taking place at this time were the deforestation of Spain and the introduction of Christianity. Surprisingly, around 35% of Spain is still classed as being forest, but it used to be a much higher figure. During Roman times there was a great demand for firewood and timber. It has recently been suggested that the deforestation of the time was one of the causes of the fall of the Roman Empire, due to it's effect on agriculture, and even the shortage of timber to sure up the silver mines reducing the supply of that precious metal. Christianity, meanwhile, had been introduced and slowly spread.